The hardest part of the walk is the decent from the carpark to the first clearing below, you’ll be walking around 150m down a not so good track that could turn your ankle if you aren’t careful, but after that the rest of the walk back to Ronda is delightful and pases through olive groves, oak trees, near to the Guadalevin river, into open countryside, and then back to Ronda via the lookout beneath the Puente Nuevo bridge. We start the second part of the walk at the carpark area near to the Virgen de la Cabeza. 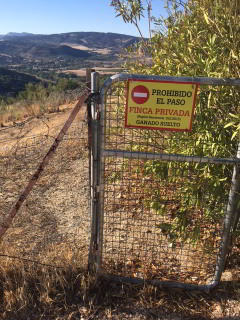 There is a chain link fence to the right, this leads to the cave church, next to that is a large wrought iron gate leading to a private house above the church, and to the left of that, which is the gate we want, you’ll see a small opening in the fence that leads to a goat track descending downwards. Beginning at the opening in the fence, continue down the goat track for 150m whilst keeping to the right. You’ll come to a clearing with a forked tree directly ahead of you, and numerous tracks leading away. We are going to take the track to the right, which is only wide enough for one person, but is only 50m long and quickly becomes very pleasant. Once again we keep to the right, and our track takes us through a delightful mini forest of oak trees. This is a gentle section with birds singing in the trees all year round, and below you can see and hear the Guadalevin river as it exits the caldera valley. Further along we encounter a gate held shut with cord (rope). Pass through the gate, but please, close it after yourselves. This gate prevents animals suchs as pigs from getting to the road. Very soon you’ll encounter the end of the walking track, and the beginning of the road. Continue to the right, going up the hill. As you ascend, you’ll see the tower of the Casa Rua to your right, and Ronda’s skyline to your left. You’ll also pass a stone cairn with a stone cross on it, this is rumoured to have been placed there by devout Catholics after Spain’s civil war to commemorate the priests and nuns who were marched to this spot by Republican militants and executed during the war. Your next landmark is a fork in the road, with a stable to the right. 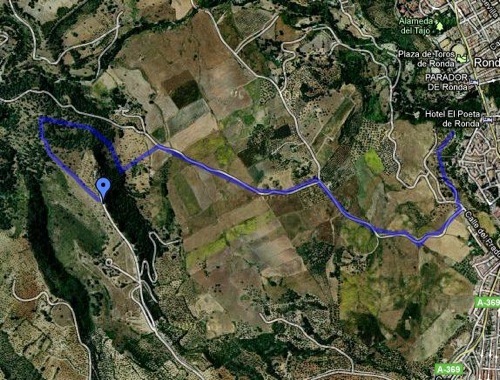 If you want to complete the walk at this point then turn to the right and 250m will see you return to the Almocabar gate. However, for those walkers who don’t want to miss the best part of the return from the Virgen de la Cabeza, turn to the left and wander downhill for 50m, and then take the paved walking track on the right. You’ll pass under one of Ronda’s many medieval entry gates (this one has been rebuilt), and will soon find yourself at the photo lookout point below the Puente Nuevo bridge. 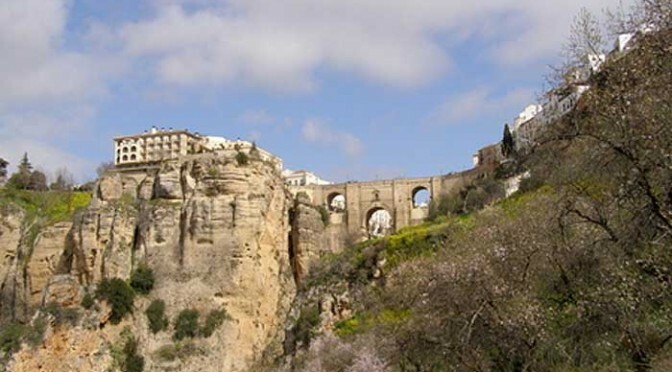 To get back into Ronda, continue uphill where you will exit in Plaza Maria Auxiliadora with the welcoming site of an outdoor cafe directly ahead.